The Port of Los Angeles is the first US member of the International Port Community Systems Association (IPCSA). The organization was originally founded in 2011 as the European Port Community Systems Association before expanding in 2014 as an international association. Richard Morton, secretary general of IPCSA, said the organization is delighted to welcome Los Angeles. 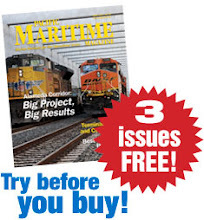 PMM Online is a complement to our monthly print publication Pacific Maritime Magazine, providing the maritime industry with information on issues as they happen – from the Mexican border to the Bering Sea – and across the Pacific. Pacific Maritime Magazine California Contributing Editor Karen Robes Meeks spent several years covering the ports of Los Angeles and Long Beach, California for the Long Beach Press-Telegram and our sister publication Fishermen’s News.